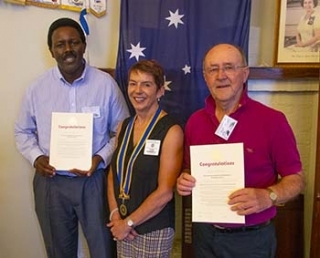 This Week's Speaker is Greg Thurston who will speak on the topic "Rotary Foundation Grants"
...And Next Week's Speaker is Laurie Croke who will speak on the topic "Matupit Island Water"
Welcome new Rotarians Tom and Bill! Acting Sergeant At Arms B Rubble Esq aka G Byland introduces Acting President Queen Victoria aka V Fennell who calls upon the Big Sook aka Peter Sukiennik for Invocation and Toast. Next in line of formalities is the introduction of guests. Terry Stewart's Thought for the Day is taken from the book “The Husband” published by Ladybird books.